If you've been living in Vancouver and riding the Skytrain in the last year, you will have likely noticed advertisements for Portland, Oregon. 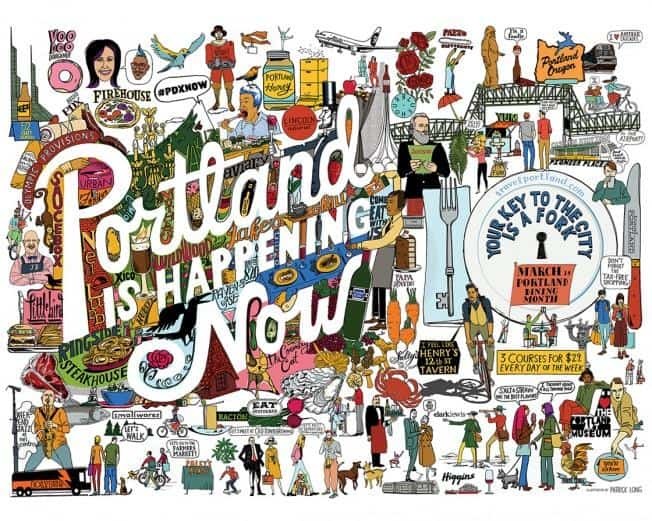 "Portland is happening now" reads cursive splashed across illustrated posters. They look like pages torn from a colouring book; a collage of landmarks, restaurants, residents, products and nature. It's the type of marketing that begs to be admired in a sort of i-spy manner. If you weren't curious about Portland before now fellow commuter, I'm guessing your interest has at least been piqued. Perhaps you've even been experiencing some FOMO (that's fear-of-missing-out); I certainly had been. It seemed I was among the last few in my social circle to make the sojourn. I heard persistent and enthusiastic chatter of breweries, doughnut shops and an enormous independent bookstore. It all seemed...admittedly offbeat. What is happening in Portland anyway? It would be impossible for me to describe exactly what is 'happening'. The best I could do is string together some examples, though they would simply represent the sum, failing the whole. It certainly wouldn't adequately convey the city's vibrant, folksy-gritty feel, but alas I will try my best. Portland is a city of curiosities. It's a place of hidden rooms; where one enters a lounge only to discover additional social spaces originally obscured from sight. Those who seek need not know what they are looking for, but will be rewarded by what they find. Portland is hip, in a way I've only ever experienced in Berlin. Keep Portland Weird has become an unofficial slogan, reminding us that the city as we know it did not come about by mere chance; shirking national franchises is all part of its organic ethos. Portland is animated. If Vancouver (B.C.) 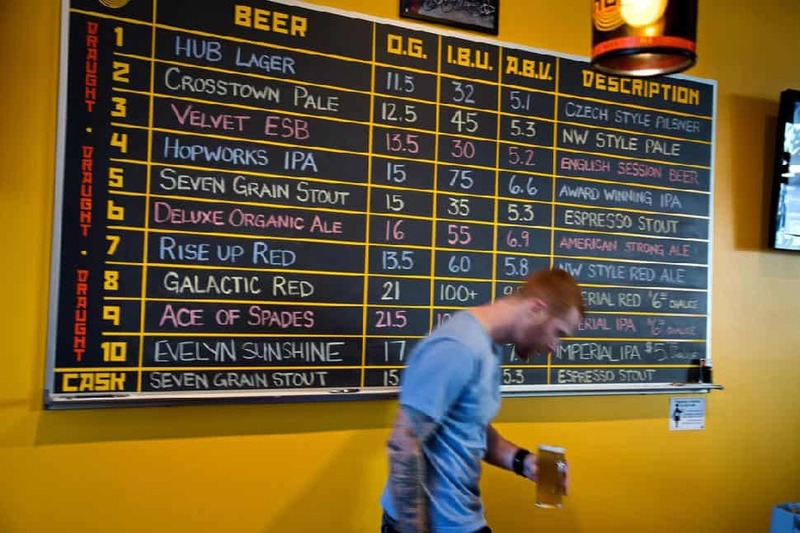 is the buttoned up, older sibling who gets a kick out of happy hour in upscale hotel lounges, Portland is the younger sibling armed with a liberal arts degree, engaging in passionate dialogue over small batch craft beer. Portland is creatively inspiring. One of the more affordable cities on America's west coast, Portland has long been an incubator for the arts. You'll see it in the hand crafted niche boutiques to the larger-than-life street murals. Lastly, Portland is intoxicating. Only in this city could the renovation of the airport result in a public outcry and consequent preservation of its decades old carpet. Carpet. People are salvaging the carpet. Hell, it even has its own Twitter handle (@pdxcarpet) and #pdxcarpet hashtag. I've never even been to PDX airport, yet I find myself being swept up in the hysteria that shrouds this oddball city. Suddenly my condo just doesn't feel complete without a vintage #pdxcarpet doormat. Suggested itinerary: 3 days, departing the early morning of day one. Caution: Washington state can become incredibly congested along Interstate 5. Bumper-to-bumper traffic can leave you creeping along the highway, adding delays of over an hour. To best avoid the headache, try to avoid Seattle during evening rush hour and check road conditions ahead of time. Using a GPS system to navigate around heavily congested areas (where possible) is advised. One of the best things about Portland, from the visitor's perspective, is its collection of defined neighbourhoods. The distinctive areas make the city easy to divide and consume. If you're working with a three day itinerary and exploring by foot, here are the neighbourhood nuts and bolts. 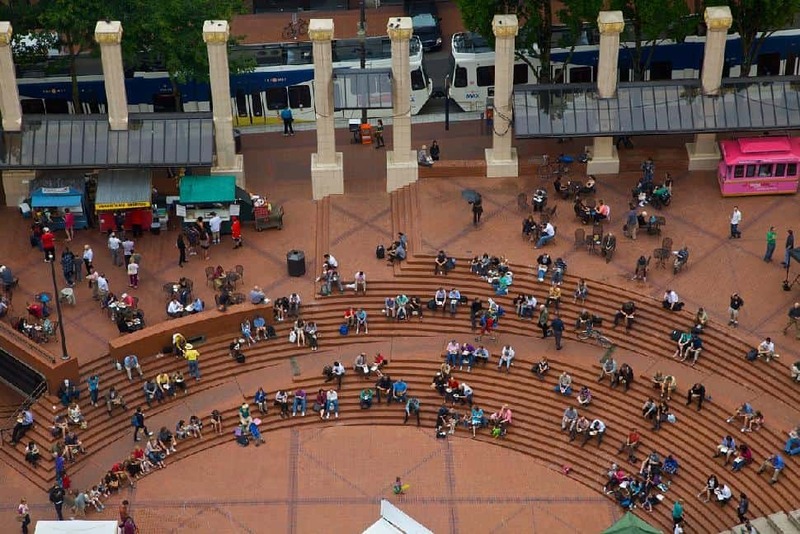 Pioneer District - Referred to as Portland's living room, Pioneer Square marks the city's buzzing centre. The public square often hosts pop up events. Grab a coffee and peruse the displays or simply people watch from the steps. If you love to eat your way through a city as I do, you're in deep my friend. There are endless methods of consuming your calories. 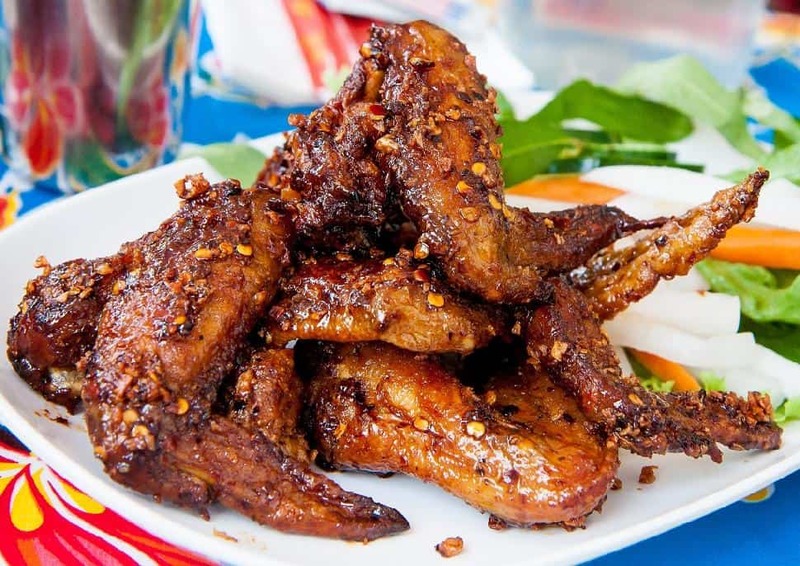 Fancy sampling a wide breadth of dishes? 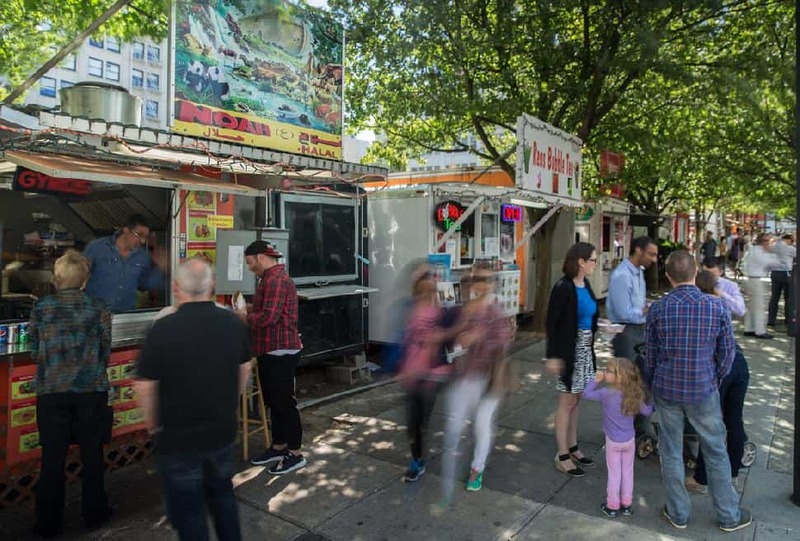 There are more than 400 food trucks in Portland, 200 in the downtown core alone. You'll find entire city blocks occupied by the trucks, affectionately known as 'pods'. Brew pubs overflow with patrons crawling the microbrew circuit, while brunch hotspots become food meccas with worshippers winding around the block. The challenge won't be finding the perfect dish, it will be generating enough hunger to sustain sampling it all. Here's what we managed to try and what's still on the list. We asked our server, "What's the most popular dish?" She supplied the answer with conviction: "Any of the eggs benny." You have three choices at Kenny & Zuke's: mushroom and caramelized onion, beef or turkey pastrami, or smoked salmon. Pastrami is Zuke's proverbial bread-and-butter, so it's highly advisable to opt for it. Wanting something lighter, I chose an everything bagel with scallion cream cheese. Being that Kenny & Zuke's is Jewish Delicatessen, I figured I'd play to their strengths. I was right. The 'everything' seasonings were generous, savory and intense, while the cream cheese was light, accented by bits of fresh chopped scallion. As if serving up great food wasn't enough, we were greeted by friendly staff and a chic, sunny yellow interior. Ask anyone from Portland where to go for breakfast and 'Mother's' will likely be the first name to roll off their tongue. In the early morning when Portland's streets are quiet and empty, you'll a small crowd milling about the bistro. What's all the fuss about? Homemade, slow-cooked, from-scratch comfort food. And the servings...they're generous. I made respectable progress on a Mike's Special Scramble (three eggs scrambled with prosciutto ham, roasted garlic, fresh tomatoes, basil and provolone cheese) but the frittata bordered on the obscene. An open-faced omelet packed with bacon, cheddar and potatoes, topped with sour cream and green onions bested my fiancé. Defeated, he asked our server if it could be packed up, to which she replied, "Awe, are you feeling a little sheepish about not finishing it all?" Yes. Actually. As with most dining establishments in Portland, food is served along with liberal dollops of charm. Mother's is a sprawling restaurant, spilling between multiple rooms, each with their own decor. (Much as you would find within someone's own home.) We were seated in the corner room, awash with white country style cabinetry and accented by gilded frames and chandeliers. Address: 926 W. Burnside St.; second location 624 E. Burnside St.
We grabbed a late night slice of 'za' (pizza) before turning in for the night. It wasn't regrettable in the least. I sampled The Gold Ring, which had me at, "White truffle oil." The oil complemented a thin crust, goat cheese and green onion. It was the definition of artisan fast food, as is often found in Portland. (You'll have to walk well south of Pioneer Square to locate a McDonald's restaurant.) Sizzle Pie earns extra points for a diverse spread of pizza dips: ranch, vegan ranch, creamy caramelized onion spread, cilantro and pepitas vegan pesto, spicy aardvark blended red sauce, and creamy basil cashew spread. The only problem with Sizzle Pie is that there's no Sizzle Pie back home. 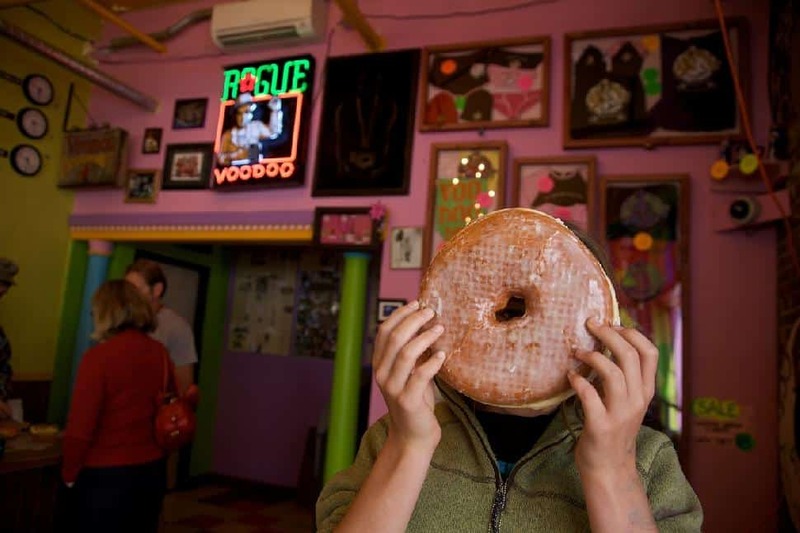 Voodoo is no simple doughnut shop. This off-the-wall doughnut retailer has amassed a cult following. In fact, you'd be hard pressed to walk down a city street without spotting a bright pink box tucked under arm. Exiting the Saturday Market we stumbled across Voodoo, identifying it by the line before the sign. Rather than queuing with a crowd of one hundred we resolved to visit later. ("Later" never happened so it remains on the To Eat list.) So what's the hoopla about? To start, there are over 90 different types to choose from. Those who offend easily should stick to the Powdered Sugar Jelly Filled or Maple Bacon. Cheeky visitors can order a Butterfingering. Oh, and if you think you saw a wedding party leaving the shop, you're likely not mistaken. Voodoo Doughnut officiates legal wedding ceremonies. And the bride and groom lived happily ever after. 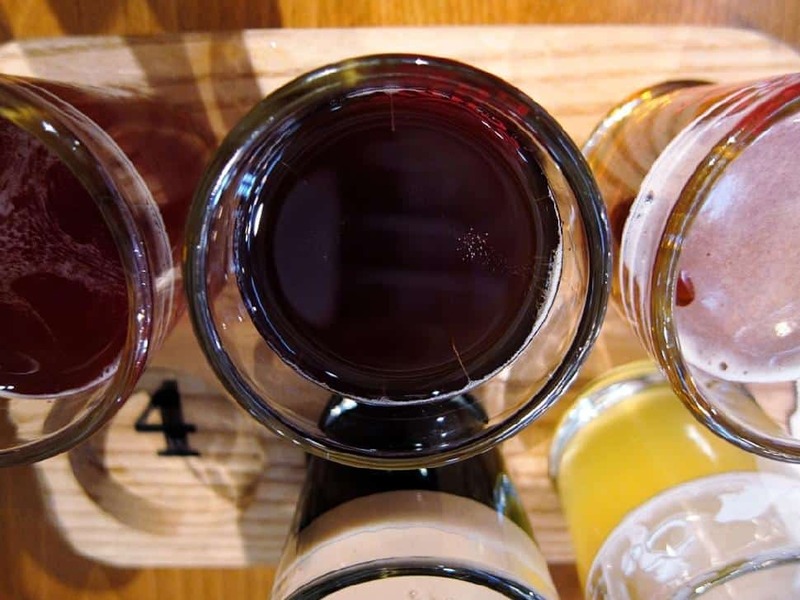 There are 51 microbreweries in Portland, earning the city the nickname Beervana. In addition to brew pubs there are jazz bars, whiskey bars, cocktail bars and plenty of patios. Basically, there is no shortage of avenues to wet your beak. It all seems to be part of the city's collaborative and social fabric. Here are the refreshments we're raving about. Tasting notes: Sweet meets savory in this cocktail made of house infused citrus vodka, muddled basil and fresh lemon. It had a light sweetness to the sip, yet was balanced by the basil's anise notes. While the decor did little to impress me (we opted for the slim sidewalk patio anyhow) most would describe Vault Martini as chic. Hours: Mon-Thurs: 4 p.m. -12 a.m.; Fri- Sat 4 p.m. -1 a.m.
Special note: Reservations are strongly advised. Call 503-954-1381 or reserve online. 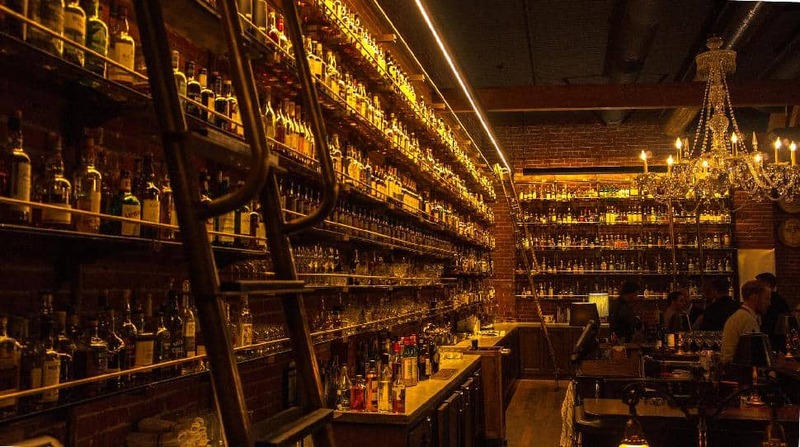 Tasting notes: Oh mama, the Multnomah Whiskey Library is the Holy Grail of whiskey bars. Passing through the door is something akin to stepping into the Gatsby era. Patrons are lead up a stairwell and through an obscured entryway, where they are immediately greeted by a wall of illuminated bottles. Fifteen hundred or so. Bartenders in brown canvas aprons ascend sliding brass ladders, deftly navigating the wall to locate a single bottle. Handsome tufted leather sofas stand among wood paneled walls and a brick fireplace. Emerald shade banker's lamps embellish long tables and portraits of well-coiffed men watch over the company. Collections of bitters, jiggers, muddlers and zesters - tools of the craft - lay scattered behind the bar. The space has the look of a gentlemen's smoking room with the warmth of an Ivy league library. Unmarked and password protected restrooms crudely expose Multnomah initiates from the members. While I found the service and food to be satisfactory relative to the impressive setting, I couldn't help feel that if the Whiskey Library was in any other city I'd find it insufferably pretentious. Midway through our visit a hostess emerged through the front door. In her arms she juggled two inflatable dolls. (The type one finds in an adult store.) She opened a wardrobe containing the smart sports coats and suit jackets of Library patrons. In went the dolls, but not without a fuss. Arms and legs comically resisted as the hostess struggled to conceal them. Once the offending guests were tucked away she fetched the dolls' owners: a bachelor party of six dressed head to toe in cowboy attire. The juxtaposition was divine comedy. Tasting notes: Gin, lime juice and a sprig of rosemary. The rosemary gimlet was innocuously tucked under the happy hour menu, and as I had just hit a home run with the Lemon Basil I figured I'd carry on with an herb infused drink. It was the first gimlet I ever had, but it certainly won't be the last. Sweet enough, the infusion was intriguing and each sip was savoured. Tasting notes: Woodford Reserve, bitters, sugar, and an orange peel make up this Mad Men classic. I take any opportunity to seek out a hidden or otherwise concealed bar. Advertised within the Ace Hotel as an underground bar, we hightailed to Pépé le Moko. A set of stairs lead into a shadowy subterranean lounge. The curved ceiling form was suggestive of an underground shelter. Otherwise shrouded in dim light, a few solitary bulbs cast a spotlight over the bartenders, who crafted cocktails over a long zinc bar. Seating just 36 persons, we loved Pépé le Moko's intimate and mysterious feel. Tasting notes: A dark beer with "a slight hop bitterness up front [that] enhances the distinctive chocolate and roasted finish. It is prized for its creamy mouthfeel and intense complex flavours." With IPA being my choice beer this summer, I wasn't overwhelmed with those I sampled at Deschutes. (I prefer them to be ultra hoppy, but I forgive those who don't share my sentiment.) What I was impressed with was Black Butte. Deschutes' flagship brew, it'd be a shame not to enjoy a freshly pulled one at this famous brewpub. In the last 10 years Portland has seen the emergence of a craft-distilling community. Five of the ten are located in the up-and-coming Central Eastside, forming 'Distillery Row'. Visitors can purchase a Distillery Row Passport, which gains them entry to tastings and premium access to backroom tours. If you've never been to Portland and are working with a lean three day timeline, here are the essential highlights. About: You can't leave the city without at least a cursory visit to Powell's City of Books. It's huge -consuming an entire city block. Put a leash on your child, spouse or parent, or risk becoming separated in a sea of books and patrons. 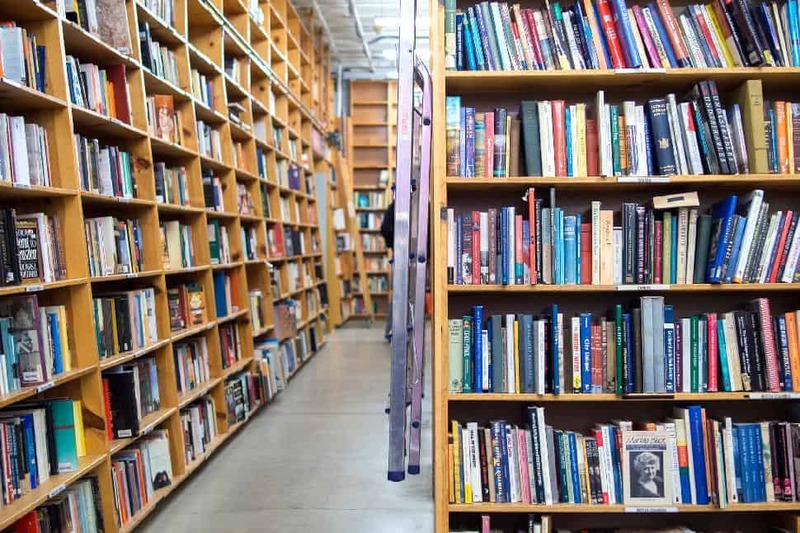 Statistically speaking, Powell's has a retail footprint of 68,000 square feet, is open 365 days per year, contains over 1,000,000 volumes, and welcomes 6,000 visitors daily. Hours: Saturdays - 10:00 a.m. - 5:00 p.m. and Sundays - 11:00 a.m. - 4:30 p.m.
Notes: Some vendors accept credit card but cash is king, ATM on site. Peckish visitors will have plenty of opportunity to sample small bites, and sip coffee or beer. 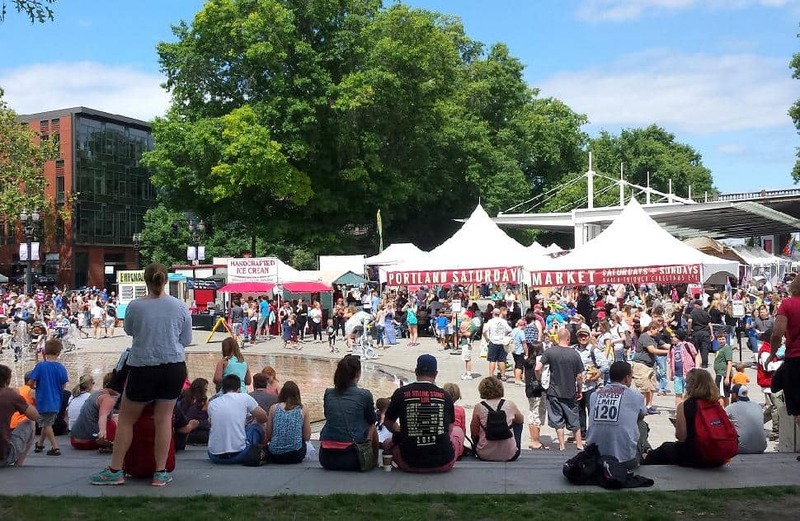 About: With 2015 marking its 42nd year, the Portland Saturday Market is recognized as the nation's longest continuously operating open-air arts and craft market. Hundreds of vendors sell everything from rubber block art prints to air ferns. About: 5 acres of Zen sprawl across this manicured property. 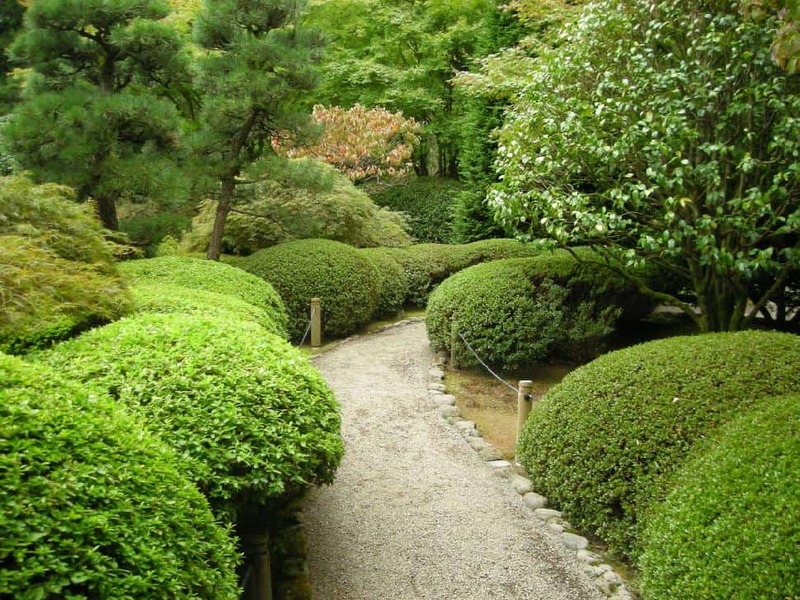 Meditate among groomed rock gardens or pass the time overlooking serene koi ponds. Follow a series of pathways over arching bridges and through the gardens. Admire the view afforded by the vantage point, overlooking Portland's skyline. Note: Portland Japanese Garden will be closed from September 8, 2015 through March 1, 2016 for construction. However, the International Rose Test Garden lies a stone's throw away, or visit the urban Lan Su Chinese Garden in the Old Chinatown Neighbourhood. Have you been to Portland yet? What would you recommend doing, eating or drinking? 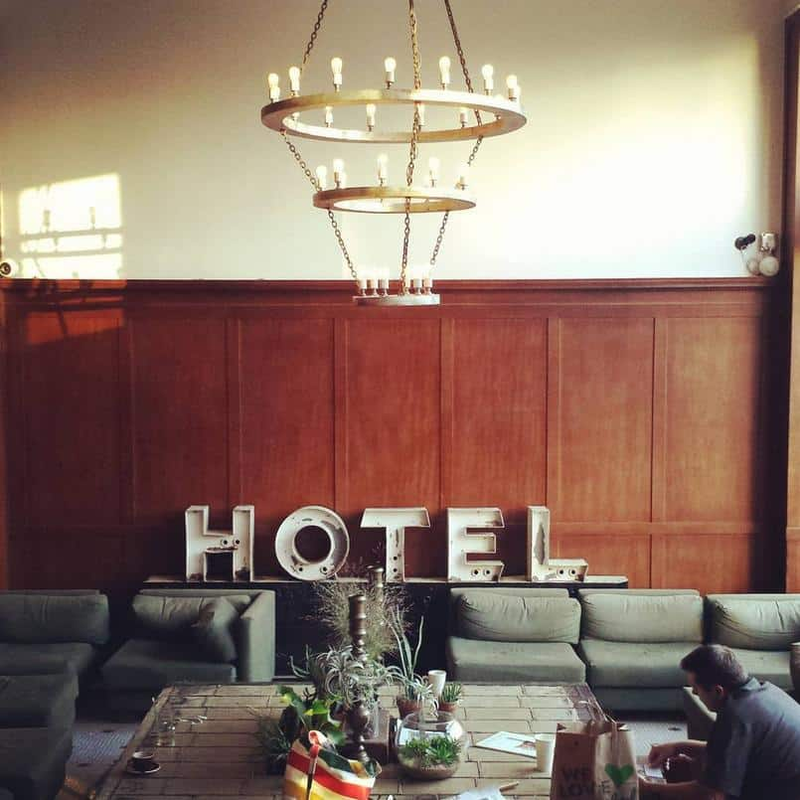 Accommodation at the Ace Hotel was provided by Travel Portland. Never before, have I been so inspired by a space; let alone a hotel. In fact, it was hard to leave! I could spend half a year penning thoughts in a notebook from the lobby's oversized sofas. If you need a hand planning your trip, Travel Portland would be just delighted to assist. 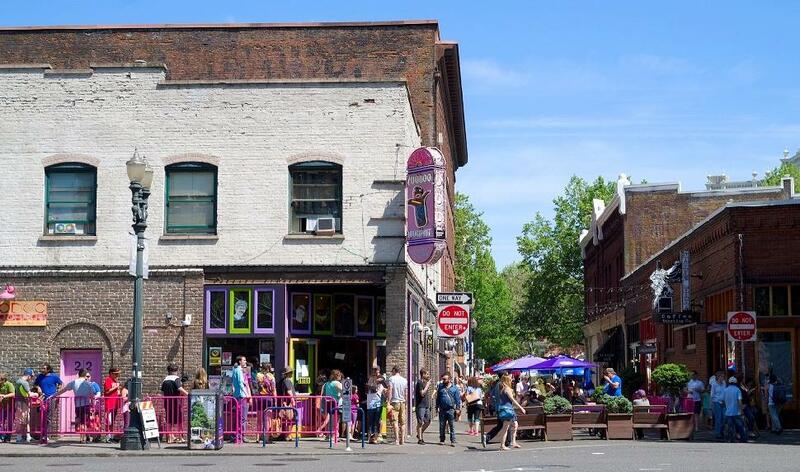 Laid back, eclectic, environmentally friendly and craft beer loving, Portland has reputation for fun.